Watching Sierra Krebsbach rally against her seventh grade brother Saturday afternoon at the Brown Outdoor Tennis Complex, one who hasn’t watched her might probably not believe that Sierra, no more than a half an hour earlier, was deadlocked in a battle at #1 singles with UW-Whitewater’s Kalla Schaefer as part of the NCAA Midwest Regional Final. On the other hand, those who have watched Sierra probably think nothing of it. From match-to-match, year-after-year, whether it is the ITA Indoor Championship, or just playing against her younger brother, Sierra’s consistency, positive attitude, and love for the game in which she has devoted so much of her life is clearly on display. Her impact on, and commitment to, the Gustavus community is one that most student-athletes have grown to admire and respect. Growing up, Sierra played tennis recreationally and did not get into competitive tennis until middle school. She was convinced to try out for the team at Mounds View High School as an eighth grader, earning a spot on the junior varsity. Sierra made the varsity the following year, yet did not play in the line-up, which was a key turning point in her tennis career. “I still remember the car ride home the night after the State Championship. I was so upset from just watching all my friends play that I promised myself that I was going to get so good that any coach would want me to play,” said Krebsbach. “Getting good” is exactly what she did. After compiling an outstanding high school tennis career, Gustavus Head Coach Jon Carlson decided to recruit Sierra to play tennis for the Gusties. “I loved the way she competed and she seemed to thrive in the competition aspect. She wasn’t very big at the time, actually she was very tiny, and yet she was battling at #1 singles,” said Coach Jon Carlson about Krebsbach when he started to recruit her. Although tennis was a major factor in her choice of school, Sierra wanted a small school atmosphere that had a rich academic tradition. “Jon kept calling week-after-week, telling me about Gustavus’ wonderful tennis program and academic history. I decided that it would be awesome to play for a program that competes for national championships year-after-year, and attend a school where the professors know your name,” said Krebsbach. Sierra’s impact on the Gustavus tennis program was felt almost immediately upon her arrival on the hill. Carlson paired her with a three-time All-American in doubles Lauren Hom and the pair clicked, finishing the season with an overall record of 31-6, as Sierra became an All-American just barely into her freshman year of college. From what could look like that pinnacle of any career, Sierra was determined not to settle and continued to improve her game. Even though she has faced adversity, and dips in her career after her early success, Sierra has always battled and always kept a competitive edge. “The confidence that she has in her own ability to persevere is another quality that you don’t see in many people. It would be easy to get negative, or to get down on herself, but she just never allowed that to happen. She knew that the only answer was to work even harder,” said Carlson. Krebsbach believes that she has grown up as a tennis player in the past four years, becoming more of a student of the game, getting smarter, and thus playing more aggressively. Sierra has developed into a model teammate, captain, and friend as well, something she attributes a great deal to her role models when she was an underclassman. “Lauren Hom and Jaime Gaard were so wonderful and such great mentors for me. I credit a lot of what I learned about the game and leadership to them,” said Krebsbach. 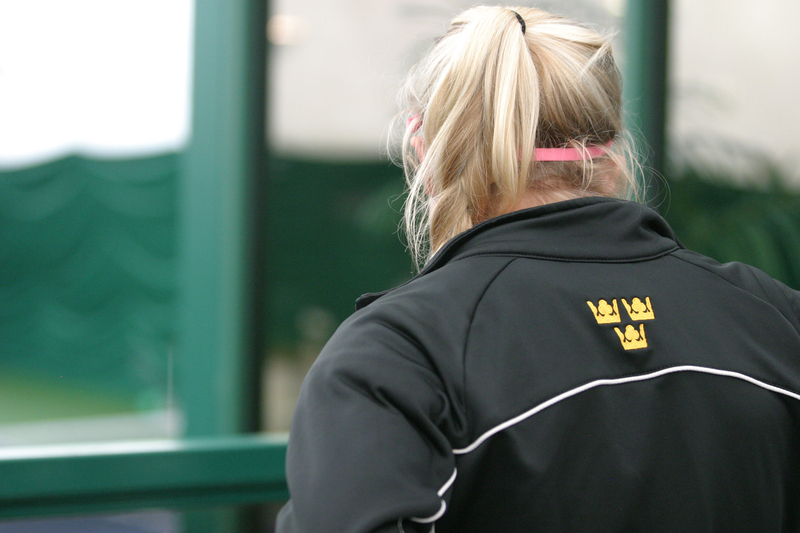 Today, Sierra is the mentor and the foundation in which the Gustavus women’s tennis team is built upon. Like many of her teammates will attest, Sierra is a model of consistency and mental strength during a match and training. “It is hard being a student-athlete, with classes and homework to always ‘show up’ for practice, but she always comes, always wants to be there, and is always putting forth a consistently strong effort and attitude,” says teammate and doubles partner Sam Frank. Franks says that Sierra was a major factor in her coming to Gustavus, and that the opportunity to play with her has improved both of their tennis games the past three seasons. Sierra displays some of the same traits in the academic world that she does on the tennis court. Krebsbach is communication studies major and carries a cumulative grade point average of 3.76. Much like she does at practice, Sierra brings great energy into the classroom, coming to class every day well prepared with questions, new contributions, and challenges for both professors and students. Krebsbach was convinced to take the communication studies route because of her love for writing and deep interest in journalism. She explains that “The communication studies professors are all so wonderful, and I have gotten such a great opportunity to work on my writing, communication, and oral speaking skills.” Sierra’s academic advisor Liela Brammer was thrilled to have a student the caliber of Krebsbach in the communication studies program. “Sierra impressed me right from the start. She chose a project on vinyl chloride in the well water in her community. Her research included Environmental Protection Agency (EPA) documents, legal briefs, medical research, and maps of toxin drift in the ground water. Sierra synthesized this complex information into a fascinating five-minute presentation. It was one of the most amazing speeches I have witnessed in a beginning speech course,” says Brammer. After graduating from Gustavus on May 30, Sierra will return home to North Oaks, Minn. where she will teach tennis for the summer, while interning at KFAN sports radio. Her plans then include a year that consists of traveling to Europe in the fall, spending the winter in Utah working at a restaurant owned by her parents, teaching tennis in the summer, and attending graduate school in the fall of 2011. Sierra spent the fall semester of her junior year studying abroad at the Danish Institute in Copenhagen, Denmark. She says that studying abroad and tennis are probably her most memorable experiences at Gustavus. The Gustavus women’s tennis team will compete in the NCAA Championship Team Quarterfinals on Tuesday, May 25 against Williams College. Sierra looks ahead to the match with much excitement and anticipation, but don’t expect her to show it during the match. “It is really interesting watching Sierra play because you really can’t tell from her body language if she is winning or losing. She is a fighter that will get to every ball. You cannot get in her head and get her off her mental game,” says Carlson. Her rock-solid mental toughness, her drive to win and compete, and her love for the game will surely make Sierra’s final NCAA tournament a memorable one. Despite the outcome of next week’s match, Sierra has a set a new standard of excellence for not only women’s tennis, but for Gustavus athletics as a whole. Krebsbach says, “It would be so great to get to the semifinals. Jon is a wonderful coach and I would love to do that for him. I can’t believe I have a week left, I will hopefully end on a good note.” If there is one thing we can bank on, it is that Sierra Krebsbach will leave it all on the court in Fredericksburg, Virginia. In addition to the NCAA Team Tournament, Sierra has also been selected to play in the singles draw at the 2010 NCAA Division III Women’s Tennis Championships, which begin on May 28. Most recently, Sierra received the 2010 Chris Evert Award by the MIAC. The award annually recognizes a senior tennis student-athlete with outstanding sportsmanship and exemplary athletic, academic, and humanitarian accomplishments. 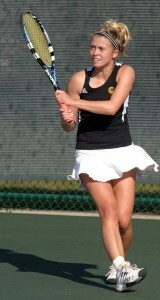 Sierra is a four-time All-Conference performer in singles and doubles. Krebsbach has gone 73-41 overall and 32-3 in the MIAC in singles, and 99-37 overall and 36-3 in the MIAC in doubles. 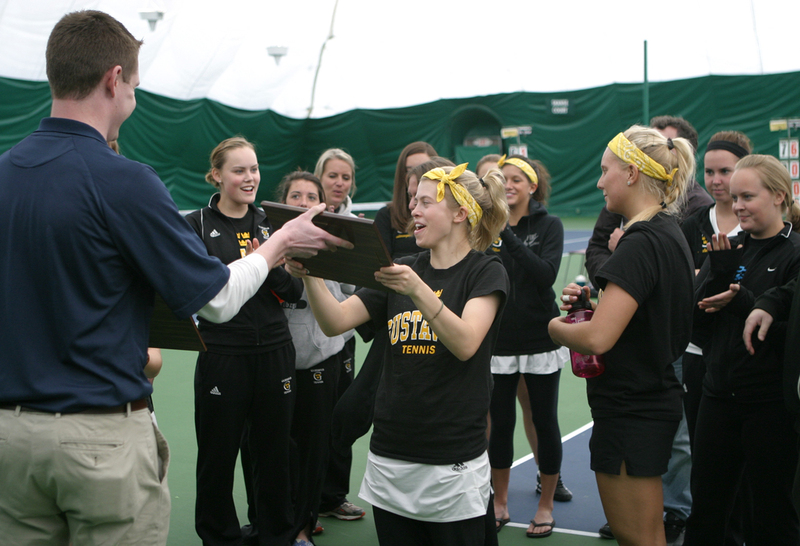 Gustavus women’s tennis team has gone 103-35 overall and 40-0 in the MIAC during her career. Krebsbach is a three-time NCAA Doubles All-American and an NCAA Singles All-American. she studied at DIS in copenhagen, which stands for the Danish Institute of Study Abroad, not the Danish Institute as is written. Overall a great story on a great person! in the references above to how she aimed at ‘getting better’ and how she drew on her mental strength and developed that reminds me of what i saw in the programs in http://www.golfmentalstrength.com where there is a parallel between golf mental game development and tennis mental game. The mental game of golf requires great mental resolve and mind focus just as much as the reach for the top in tennis.